Whether you love it enough to put on steak or agree with every word of this impassioned argument against it, we can all agree that ketchup is supposed to come in the form of a moderately thick red sauce; ideally, for dipping chicken nuggets and loosely glueing cheeseburger layers together. Despite this understanding, people have created things like ketchup slices and green ketchup. And now, there’s actually such thing as ketchup “caviar.” Really. 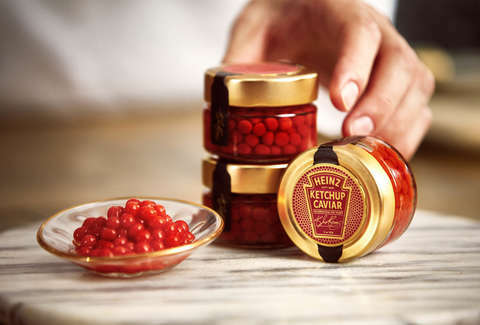 In a stunt tied to Valentine’s Day, Heinz announced on Thursday that it’s launching a new, limited-edition take on the classic condiment called Ketchup Caviar. The idea, according to the ubiquitous ketchup purveyor, is that ketchup is fancy enough for a romantic dinner when you can scoop little red blobs of it out of a glass jar. Or something like that. To be clear, the Ketchup Caviar isn’t caviar at all, as it doesn’t contain even a trace of roe. The stuff is literally the Heinz ketchup you know, squeezed into small, caviar-like balls. Heinz suggests scooping them onto a gourmet burger or sprinkling them over some roasted potatoes, because that sounds totally normal. You’ll have to act fast if you hope to get your hands on this ultra fancy, ultra-weird ketchup, though. Heinz said it will be releasing 150 jars of the stuff from now through January 28. You can try to claim a jar here via its Twitter account, but maybe you should pause and think about your life and your choices first.